The Royal Windermere Yacht Club has marked the start of its 2019 racing season by a new Race Control Boat named ‘Retriever III’. 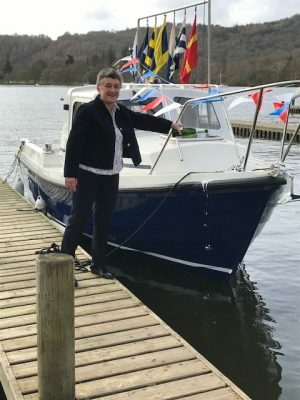 The naming ceremony, performed by the Royal Windermere’s Commodore Mrs Clare Houlihan, was held on Saturday 23rd March 2019 following the club’s AGM. ‘Retriever III’ is an Orkney Pilothouse 20 boat, powered by a Suzuki 60HP outboard engine. The boat is the club’s official vessel used by the Race Officer and his/her team to officiate every race. The Race Officer sets each course from the vessel, arranges the start, monitors the race, provides timing information, records results, and finishes the race. An Orkney Pilothouse 20 is a 20-foot motor boat with a raised weather-proof wheelhouse providing excellent all-around views and plenty of cockpit and cabin space, all of which is important for the Race Officer and his/her colleagues. Ready for an exciting season ahead, Commodore Clare Houlihan adds that club’s racing commences on Thursday (4th April) with the first dinghy race of the season; regular races of the Windermere Class 17 Foot fleet and ‘Flying Fifteens’ also begin on 4th April. All classes will race until September. Youth training sessions are also a regular feature of the club’s season, taking place on Friday evenings and Saturday mornings and in school holidays. In addition to the regular racing, some particular highlights ahead including the Flying 15 Lakeland Grand Prix Open Meeting on 13/14 April, and a new Open Meeting for RS100s at the end of June.